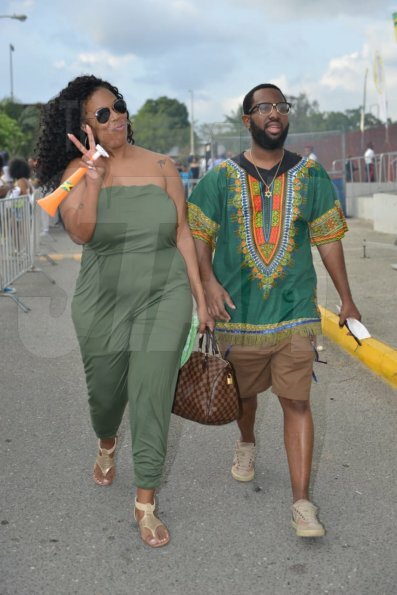 Patrons attending the first concert of Buju Banton's Long Walk to Freedom tour are dressed to the nines. Some persons have apparently come out to ensure that all eyes were not only on stage but also on their eye catching ensemble. Mesh merinos, shorts, African-style garbs and of course, the Rastafarian colours of red, green and gold have been incorporated into almost every outfit. Mr Lex and Allison Ferron. Maureen Segree journeyed from England to see Buju Baton perform. Pauline Daley Simms, who is originally from St Elizabeth, but lives in England, is making a fashion statement. Farrah Harrison (left) and Leror Milteer flew in from Atlanta for the show. Carla Campbell is feeling the music.